A breed standard is the guideline which describes the ideal characteristics, temperament and appearance of a breed and ensures that it is sound and fit for function. official Kennel Club breed standard. Giving extra information on each part of the standard is a valuable means of learning more about the breed and of training judges. It augments the information already available on each part of the dog and is a helpful tool in deepening understanding of what the ideal of the breed should look like. It is a popular misconception that that Petit Basset Griffon Vendéen, or PBGV, is a type of Basset Hound with a longer coat. The two breed names share the word "Basset" but they have few real characteristics in common. 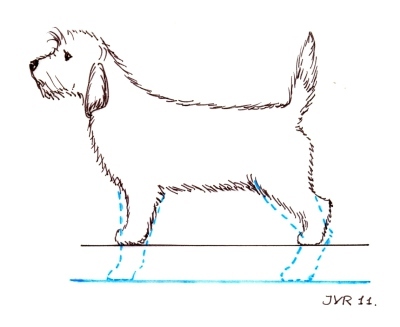 The PBGV is far smaller and lighter boned and, although the same height, parts of the PBGV's body are shorter than those of his more familiar Basset Hound cousin. From their larger ancestors, French hounds were gradually bred into their present day form not only for type of prey but to cope with the needs of their particular geographic area. For the hounds of the Vendée, the dense, thorny, vegetation of this rocky region made hunting difficult. Leading into the 19th century, a hardy dog was needed - one with physical and mental stamina and whose coat would resist the brambles and thorns. Several rough-coated hounds, including the Basset Griffon Vendéen, were developed specifically for hunting in this difficult terrain. Coupled with this, deer hunting had long been the sport of kings and noblemen, who could afford to ride on horseback using these large, swift, powerful hounds. Those not as wealthy followed smaller game and even boar on foot -and for this they needed a slower hound. The most practical way to restrict speed was to shorten length of leg. Thus, evolution and breeding strategy produced a practical "low-to-the-ground" scenthound ideal for both local terrain and pace. 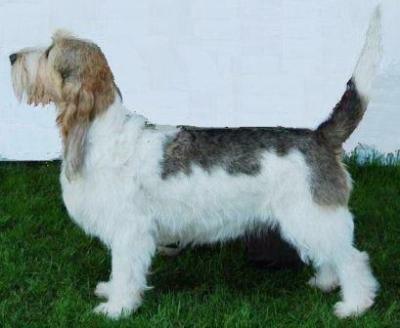 An attempt to standardise the Basset Griffon Vendéen was not undertaken seriously until the latter half of the 19th century when the breed began to appear at dogs shows, such as the large Paris one. Before 1898, when the first official standard of the Basset Griffon Français was adopted, judges at the great French "expositions" made their decisions without the benefit of this guidance on breed type. Moving on in time, the development of Griffon Vendéen hounds in France became linked in every way to the Dézamy family from La Chaize-le-Vicomte. With the formation in 1907 of the Club du Griffon Vendéen, Paul Dézamy was its first President. 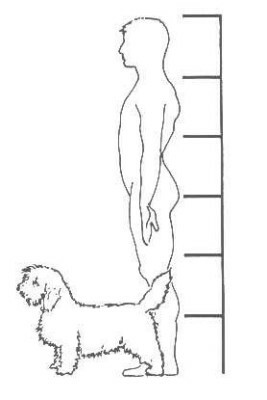 In 1909, a standard for the Basset Griffon Vendéen recognised two types of BGV, the variation in height and the significant difference in crook of front leg. The Grand had straight front legs, the Petit sometimes had a semi-crook. 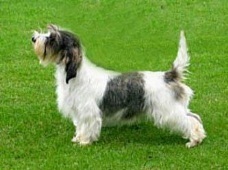 In the 1950s new standards were published and the PBGV was given an official standard of its own and considered a separate breed. However, with the earlier practice of interbreeding the Petit and Grand, it was common at that time for offspring from the same litter to be of both Petit and Grand type - and Paul Dézamy became noted for his distinct 42cm Grands, referred to as "42 Dézamys". 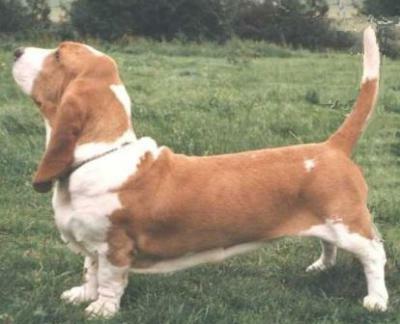 In 1977, his grandson, Hubert Desamy, finally banned interbreeding -but for many subsequent generations the results of this practice manifested themselves until the Petit Basset could be said to be free of Grand Basset traits such as overall heavier appearance, longer back and heavier ears. The arrival of the PBGV in England in 1969 was followed in 1978 by formation of a UK BGV Club. The name was carefully chosen to allow for the later establishment of the Grand Basset under the same umbrella. Although first and foremost a hunter, still used passionately in its homeland France, some European countries and North America where it hunts small game, especially rabbit and hare, nowadays the PBGV is predominantly seen in the show ring and makes a wonderful family pet. 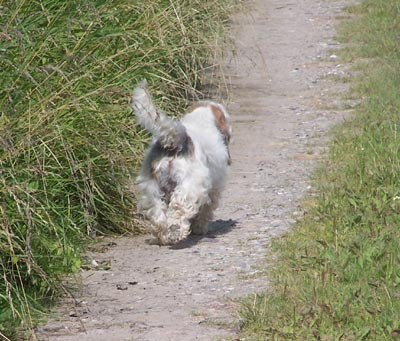 What Characteristics does the PBGV possess? 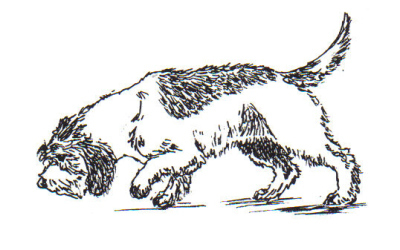 The PBGV is an active hound, bold and vivacious in character; compact, tough and robust in construction. He has an alert outlook, lively bearing and a good voice freely used. The head, so often carried proudly, can be dropped with ease for scenting and following a trail. Here you can see a comparison between the size of the PBGV and a 6 foot (1.82m) man. Both are drawn to scale. 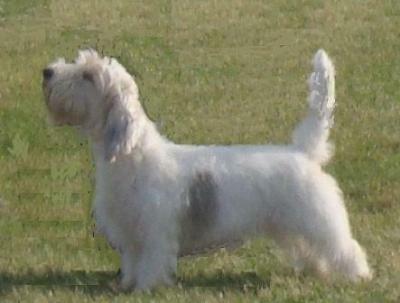 The PBGV is well-balanced with a rough, unrefined outline, weighing approximately 14½ - 19kg (32-42lbs). Height is 34-38cms (13½-15") and, measured from sternum to buttocks, he is approximately 50% longer than tall. The PBGV fits into family life with ease - though any owner needs to bear in mind his origins. As a scenthound, if he gets on the track of something, he will go!